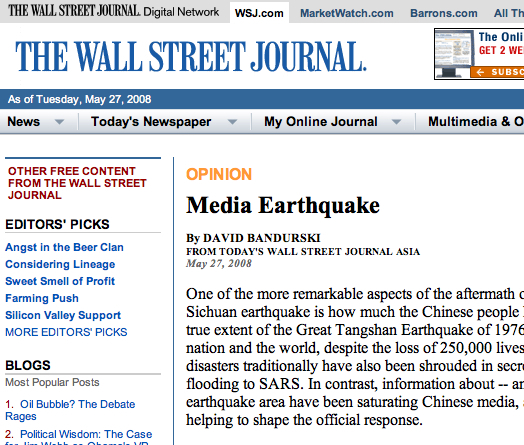 Most people who work in any way with the media in China would probably agree that corruption in the industry is endemic. Most would probably also agree that the situation is growing steadily worse. In its earliest stage, news extortion involved upfront demands for cash by journalists. But as this conduct came under fire, the practice was developed and refined and payments to journalists and media to make negative reports disappear were “whitewashed” as advertising buys, circulation income, publicity fees and all manner of things. As the practice evolved, cooperation between the people on the business side who handled advertising contracts and the reporters in the field became more and more intimate, until everyone was involved — with the editor-in-chief and president pulling the strings behind the curtain. From what we can see of the 21cbh.com case, it seems to be a perfect illustration of how news extortion in China has become institutionalised and industrialised. The danger in this situation is that some media outfits engage in the practice without compunction, knowing that in most cases enterprises will simply give in just to avoid trouble. The core causes go unaddressed. Chief among these is the inescapable fact that media and information are defined as tools of power. Look no further than the “Marxist View of Journalism,” which states that all news must serve the interests of the Chinese Communist Party. When political power is given precedence — as opposed to accuracy, relevance and the public interest — the upshot is that all media are in a sense morally bankrupted. Those who possess sufficient power can exploit the media. Conversely, media, as extensions of power, can apply that power for economic gain in a competitive, commercialised media environment. Another unfortunate consequence of the predominance of political power in the media is that campaigns designed to assert “ethics” and “discipline” can be distorted to serve narrow political ends. Threatened with negative reporting by newspapers or magazines, government officials can cast probing journalists as profiteering frauds. All of these questions about the truth, ethics and power are now swirling around the recent case of the detention of three journalists in China’s northwest province of Gansu. Is this a case of poor media ethics? A case of the arrogance and license of unchecked power? Perhaps, as so often, it is a case of both. The following is a translation of a recent report by Caixin Media on the case of the three detained journalists in Gansu province. At around 11PM yesterday (January 18), late at night, an announcement through the official Weibo account of the Wuwei City Public Security Bureau in Gansu province reported that “police in Liangzhou District are legally investigating journalists for in a case of extortion and blackmail.” This [announcement] responded directly to a wave of public opinion concerning the “disappearance” of three journalists in Wuwei. The notice said that on January 18, police in the Liangzhou District of Wuwei had submitted a request to the procuratorate in Liangzhou Districtfor for arrest warrants for a certain Zhang and two other journalists, under charges of extortion and blackmail. On January 7, the notice said, police from the Liangzhou branch of the Wuwei Public Security Bureau had looked into a criminal case involving a lawbreaker (违法人员) identified as Zhang (张某某). In the course of its investigation, the Liangzhou branch found that Zhang had worked with a certain Luo and another Zhang since 2011 to carry out acts of extortion for financial gain, using their identities as journalists and rationalising their actions as supervision by public opinion (舆论监督). According to Article 267 of the Criminal Law of the People’s Republic of China, Zhang and the others had been placed under criminal detention for extortion and blackmail by the Liangzhou branch. According to reporting and verification yesterday by Caixin reporters (SEE “’Disappeared’ Journalists in Gansu Were Threatened to Leave Wuwei City Prior to Facing Extortion Charges”), the three journalists are work in the Wuwei bureaus of the Lanzhou Morning Post, the Lanzhou Evening News and the Western Economic Daily. All three are commercial newspapers that have strong influence locally in Gansu province and are registered under the Gansu Daily Newspaper Group and the Lanzhou Committee of the Chinese Communist Party. This incident drew attention on the internet after a post made the rounds called, “Many Journalists in Gansu Detained for Extortion, Were Previously Digging Into the ‘Chocolate Girl’ Incident” (甘肃多名记者涉嫌敲诈被捕，曾深挖‘巧克力女孩’事件). Soon after this, police in Wuwei said the three [suspects] had not been detained in relation to the story of the suicide death of a female student after she was caught stealing chocolate in Jinchang City. Instead, [police said], the three had coordinated to “commit extortion against the government and individuals” while reporting in Wuwei, and had “already been criminally detained.” The police said that had notified the newspapers and family members. According to the reporting of the Caixin reporter and official releases from the Wuwei police, the first to be taken was Zhang of the Lanzhou Morning Post, who was subjected to administrative detention on January 7. The other two journalists were taken on January 8. Family members of the journalist surnamed Zhang from the Lanzhou Morning Post told the Caixin reporter that Zhang was unreachable starting from the night of January 7, and on January 8 the police issued them a notice saying Zhang was being detained for five days under criminal suspicion. On January 14, after the expiration of this term, when family members arrived at the detention centre to meet Zhang, they saw that Zhang had been placed in handcuffs and was being transported to the prison. The family members received a formal notice from police saying that the journalist was being criminally detained on suspicion of acts of extortion and blackmail. As the Caixin reporter was looking into the case yesterday, the Lanzhou Morning Post said that it had learned the news on the morning of January 18, that its leaders were in the midst of discussions, and that it had no information it could share at the moment. An employee in the office at the Lanzhou Evening News said police had come to the office on January 15 to confirm the credentials of its journalist. “I can tell you, first of all, that the journalist Luo is certainly one of our reporters, and second that all other information is to follow the lead of the Public Security Bureau.” This employee said that they had not personally seen the criminal detention notice, and that they knew nothing further. After checking with their superiors, an employee in the office of the editor-in-chief at Western Economic Daily told the Caixin reporter that so far the police had provided them with no formal documents in writing of any kind, and that if they wanted to learn more about the situation they should get in touch with Wuwei police as the paper was not in possession [of the facts]. Up to now police in Wuwei have released no details concerning the “numerous concrete cases of extortion and blackmail committed” by the three suspects. But one source familiar with Zhang, [one of the suspects involved], revealed to the Caixin reporter that prior to their arrest, the journalist, Zhang, had been singled out by police, and some had said they wanted to see them driven out of Wuwei. The source also said that in recent years, the Lanzhou Morning Post, Lanzhou Evening News and Western Economic Daily, all “provincial-level media,” had all done watchdog journalism [“supervision by public opinion”] about Wuwei. PreviousWho Sold Out China’s Health Forums? NextThe woman who menaced the state?